Now California local businesses and residents can take advantage of affordable container delivery service. 20FT and 40FT storage container delivery service for local businesses and residents. Serving entire Northern California, Nevada and Oregon. Hunting around for the best deal - our prices are very, very low! Begging your local trucking company for better rate and faster service. Struggling to get your equipment on time - we deliver containers right to your door! All Bay Trucking offers fast, reliable transportation service, at up to 50% off what most trucking companies charge; a business-friendly alternative that also makes great economic sense. You'll get most reliable trucking service in Oakland with tilt-bed trailers, fast chain-drive load and unload, overall affordable relocation service of shipping containers. 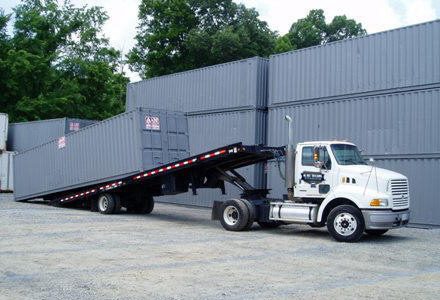 We can pick up and deliver 40FT and 20FT empty storage or cargo containers directly from the depot. We're an East Bay business that serves Oakland, San Francisco, Peninsular, San Jose and surrounding East Bay Area. We recently expanded our services to entire Nor-Cal as well as bordering regions of Oregon and Nevada states. All Bay Trucking is capable to delivery up to 10,000 lbs of weight, either it is the container, vehicle or cargo. If you are to order our services, please verify that shipping container is empty. If you are interested in dryage services from Port of Oakland, we do recommend to contact dryage directory. Our tilt-bed trailers cannot pull loaded shipping containers. Our small maneuverable trucks will deliver your empty storage container virtually anywhere in Northern California, whether is Sacramento, Redding, San Jose or Santa Cruz. Call 510-545-9702 for a Quick Quote! Get FREE estimate now: We'll pick up containers from any Depot in Oakland, Port of Oakland, Port of Richmond, directly from your business or private lot.